If you're preparing to remodel your kitchen, then this book is for you! Kitchen cabinets are essential to any kitchen's overall design, since they are probably the most prominent and noticeable feature in your home. Whatever decisions you make when incorporating cabinets in the kitchen will ultimately dictate a number of things, including the visual appeal of your kitchen, its storage capacity, as well as the functionality of the different cooking areas. It therefore goes without saying that the cabinet designs could very well make or break your kitchen's function and style. Improper planning would come with consequences that you, as the homeowner, would have to live with for many years to come. 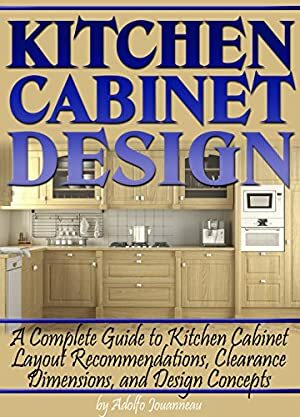 This ebook is designed to be a guide for new homeowners or home remodelers out there looking for a step-by-step process of selecting and adding cabinets to their kitchens. Be sure to read the book in its entirety before starting. Not to worry though, it's intentionally kept short and sweet so you can get started right away. Download now and you'll be ready to go in no time! We started tracking this book on January 15, 2016. The price of this book has changed 22 times in the past 1,195 days. The current price of this book is $2.99 last checked 12 hours ago. The highest price to date was $4.99 last reached on January 11, 2019. We last verified the price of this book about 12 hours ago. At that time, the price was $2.99. This price is subject to change. The price displayed on the Amazon.com website at the time of purchase is the price you will pay for this book. Please confirm the price before making any purchases.